Since the time change, having daylight AFTER work makes me feel like I have more energy and more time. While the initial change feels like a drag (during spring), the result is always rewarding. With the change in time came a change in weather, too. Our brief rainy days came and went as quickly as a kid eating ice cream. I wore my Hunter boots for what feels like the last time of the season on a day when rain was predicted but didn't last long. All's well that ends well, right? At least I'll remember fondly when these Hunter boots served their purpose. It's lovely to see you wearing your Rubber Wellingtons you look adorable and we are kindred spirits. Yes on this look and yes on your thoughts. I'm so happy that we have daylight after 4pm and that it's nice and sunny out. Spring is in the air! By the way, totally love your hair like this. Fab dress and coat! I love Hunter boots! Those look so good with your outfit Nancy. I'm loving the extra light in the evenings. I feel I can get more done. It's starting to warm up here too. 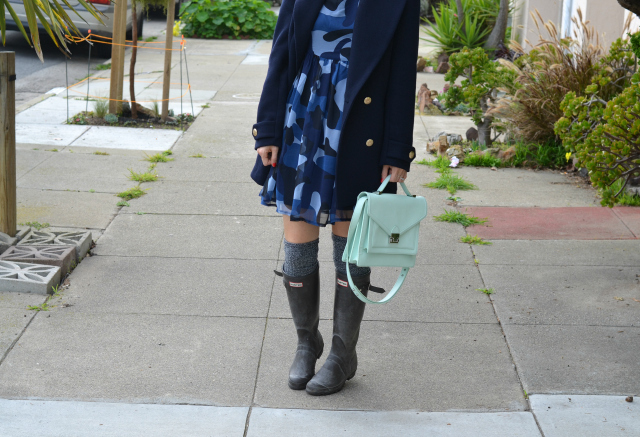 I love the idea of wearing thigh highs with rain boots! Your dress is so cute! You are just too cool for me;) Love this! So cute! I love how the masculine print looks on the flirty dress! That dress is such a cool take on camo print! I am really enjoying the longer days too. Love the print of that dress and how fun with the long socks too! Awww.. I miss my Hunter Boots. I left mine home back in Chicago because I didn't think I would need it abroad in Asia where it's super hot all the time. Love the outfit. Hope you could check out my blog. I'm giving my readers 20% off their purchase from Otaki Clothing. i always felt the same way with daylight savings time during the spring. always brings so much more energy! Great look ! Very cute, I love this combination of rain rubber boots with over the knee socks , so trendy !